Vancouver, British Columbia - Lumina Gold Corp. (TSXV: LUM) (OTC: LMGDF) (the “Company” or “Lumina”) is pleased to announce additional drill results from the Cangrejos infill, step-out and depth extension program. These three holes (C18-90 to C18-92) represent the most recent results from the 2018 drill program, which has totaled approximately 8,800 metres over 22 holes. The Company is continuing to drill at the property and has just completed hole number C18-94. Hole C18-90 was a vertical-hole that stepped out approximately 50 metres from the edge of the 2017 deep discovery zone. The drill hole cut one of the longest zones of continuous mineralization ever drilled at Cangrejos, 346 metres averaging 1.13 g/t gold and 0.17% copper. The closest hole in that zone is the previously released C17-58 that cut 126 metres grading 3.64 g/t gold and 0.54% copper from 292 metres within a broader interval of 305 metres averaging 1.90 g/t gold and 0.30% copper from 286 metres. Hole C18-91 successfully tested the northeasterly continuity of the mineralization within the central-northeast quadrant of the resource and cut multiple intercepts from 46 metres to 364 metres, as detailed in the table below. Hole C18-92 was added to the drill program after hole C18-78 intercepted 90 metres averaging 1.27 g/t gold and 0.11% from surface. The drill hole was inclined to the southeast in order to extend the known mineralization in this direction. C18-92 cut two intervals between 106 metres and 270 metres, as detailed in the table below. Holes C18-93 and C18-94 were subsequently drilled as further northeasterly step-out holes to C18-92, which advanced the drilling into an unexplored area of the deposit. The results from these two holes are pending. Note: Intervals in the reported holes are calculated using a cut-off of 0.2 g/t Au with maximum internal dilution of ten continuous metres. The highest gold value used in the reported weighted averages is 6.77 g/t Au. Above cut-off intervals of less than 15m are not reported. In addition to the above results there were multiple intercepts of lower-grade material in the drill holes. All Lumina sample assay results have been independently monitored through a quality control / quality assurance ("QA/QC") program including the insertion of blind standards, blanks and pulp and reject duplicate samples. 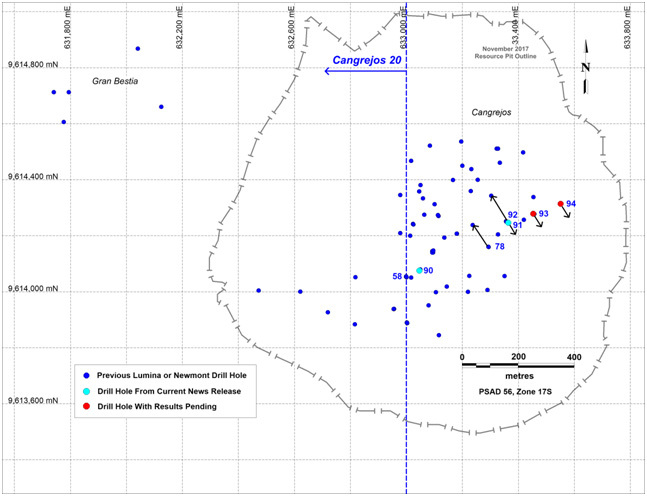 Logging and sampling are completed at Lumina’s secure facility located at the Cangrejos project. Drill core is sawn in half on site and half drill-core samples are securely transported to ALS Lab's sample preparation facility in Quito, Ecuador. Sample pulps are sent to Lima, Peru for analysis. Gold content is determined by fire assay of a 30 gram charge with total copper content determined by four-acid digestion with ICP finish. ALS Labs is independent from Lumina.